WASHINGTON, D.C. — Clementine Hunter was born into a laboring family on a Louisiana plantation about 20 years after the abolition of slavery. Self-taught, she would later become one of the most prominent folk artists of her time. “Clementine Hunter’s World” tells the story of her life. The documentary, created by filmmaker Art Shiver, premiered on March 24 during a special screening at the Oprah Winfrey Theater in the National Museum of African American History and Culture in Washington, D.C.
Hunter, whose grandparents had been enslaved, worked as a laborer with her family at the Melrose Plantation near Natchitoches, Louisiana. 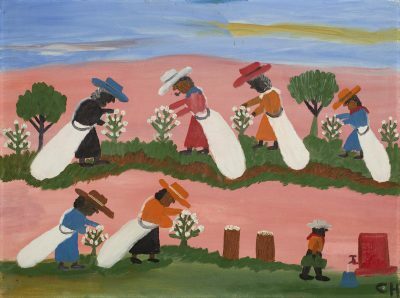 Despite Hunter’s preference when she was young for working in the fields over “book learning,” she would go on to become one of the country’s most influential folk artists and painters — documenting plantation life through the eyes of a black woman. The documentary follows Hunter as she grows up on a plantation in the early 20th century. Hunter spent nearly all of her time farming in the fields or working inside the plantation house as a domestic worker. Hunter began to paint after she found brushes and tubes of paint in the house she worked in, and she began to gain exposure in the 1950s. She painted everyday life on the plantation. Francois Mignon, the plantation curator at Melrose, supported Hunter’s artistic career and supplied her with paint and materials. After seeing Hunter’s first painting she made of a baptism in Cane River, Mignon recognized Hunter’s artistic talent. Mignon and Hunter forged a lifelong friendship. “In spite of all the difficulty, he never gave up,” Shiver said on Mignon’s persistent support of Hunter during the panel that followed the screening. Mignon prompted Hunter to paint some of her most popular works still to date, including her African House murals. “If you look at her paintings, it’s a body of work that says, ‘This is how we lived,’” Shiver said in the panel. “Clementine Hunter’s World” is narrated by San Francisco-based journalist Noelle Bellow. Bellow follows Hunter’s evolution from her life as young girl working on the plantation until her death, at which point Hunter was a world-renowned artist. Henry Price, supervisor of art for the Caddo Parish School Board, also spoke on the panel. The documentary showcases some of Hunter’s most popular pieces as well as clips and footage of Hunter’s hometown in the Cane River region of Louisiana. The film also includes appearances from Price and Tom Whitehead, Hunter’s close friend and biographer. Following the film’s screening, a panel was held featuring Shiver, Whitehead, Price and Molly Baker, former Property Manager at Melrose Plantation. Several of Hunter’s family members were present at the screening, as well as descendants of the Metoyer family, who owned Melrose Plantation during Hunter’s time there. Following the panel, several audience members asked questions of their own about the film or Hunter herself. All four panelists and Bellow contributed to the questions and conversation. “Clementine Hunter’s World” is accompanied by a special exhibit dedicated to Hunter and her paintings at the National Museum of African American History and Culture, and the gallery is open to the public through Dec. 19.